Oppo is one of the world’s largest smartphone vendors. The company is placed in fourth place in the Indian smartphone market. Although Oppo returned to the flagship smartphone space with the launch of the Oppo Find X, the company is more widely known for its F mid-range series (in international markets) and R upper mid-range/flagship series (in China). The Oppo F7, launched in March, was Oppo’s first phone with a display notch, and it was powered by the MediaTek Helio P60 SoC. It was followed by the launch of the online-only Realme 1, which shared most of its specifications with the F7, but managed to be significantly cheaper. Now, the Oppo F9 and the Oppo F9 Pro have received Bluetooth certification, indicating that they may launch soon. 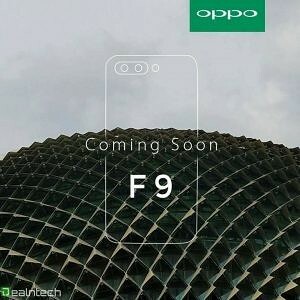 Oppo typically refreshes its mid-range phones every six months, so it’s fair to expect the Oppo F9 to launch in late August/September. DealNTech was able to find an alleged-to-be official company teaser for the Oppo F9. The teaser shows a render of the back of the smartphone, and we can observe a dual rear camera placed on the top left. In contrast, the Oppo F7 had a single 16MP rear camera. The Bluetooth certification of the Oppo F9 reveals that the phone will have Bluetooth 4.2 with model number CPH 1823, CPH 1825, and CPH 1881. Notably, the Bluetooth certification listing shows that the Oppo F9/F9 Pro has the same Bluetooth module as the Oppo F7, Oppo F7, Oppo R15, and the Realme 1. This means that the phone will likely be powered by the same MediaTek Helio P60 SoC (MT6771). The Oppo F9 will likely be launched internationally just like its predecessor. In India, the Oppo F7 was launched for ₹21,990 ($320), but is now available for ₹19,990 ($291). It’s probable to expect its successor to be launched at a similar price. We expect to learn more about the F9 in the coming weeks.